Editor(s): Soonthornthum, B.; Komonjinda, S.; Cheng, K.S. ; Leung, K.C. The Pacific Rim Conference on Stellar Astrophysics, PRCSA, is a series of conferences which initially focused on binary star research, yet over the years it has grown wider in scope to include topics regarding the most fundamental building blocks of modern astronomy and astrophysics. Since its inception in 1985 each conference has been held in a country on the Asian Rim of the Pacific. In the most recent decade the conference has been held every three years. The 8th PRCSA was held in Phuket, Thailand in May 2008. Although it is called the "Pacific Rim" conference series, the participants are not restricted to scientists from Pacific Rim countries. This conference has attracted nearly 100 participants from 23 countries from far regions of the world. 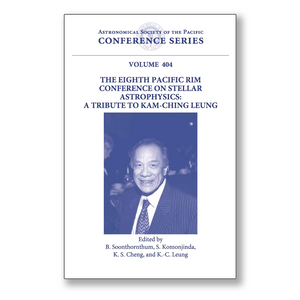 The 2008 conference also served another important purpose: to honor Prof. Kam-Ching Leung for his contribution in supporting the development of astronomy in Asia, particularly in Thailand. The proceedings of this conference are published in this volume and include contributions on stars, star formation, novae, supernovae, compact objects, binary stars, cataclysmic variables, variable stars, binary and multiple star systems, brown dwarfs and planetary companions, stars clusters and large-scale surveys.